Doc Roots is a loyal Jenks customer and a quality local handyman. Both reliable and trustworthy, Doc Roots has built a good reputation doing repair work in NE DC for a long time. He can be reached at 202-427-0745. Noble Britt (pictured right painting our building) is a resident of the Trinidad Neighborhood and a high-quality painter. How good is he? Good enough where we hire him to do our painting. The building looks great and was professionaly done at a reasonable price. Noble can be reached at 202-487-6389. Integrity Renovations is a "Veteran owned, Daughter POWERED" local small business. Jesse Greaves does a lot of local renovations and is a good resource when look for handy work or medium-sized renovations. Jesse can be reached at info@integritydc.com or over the phone at 202-417-7254. GL Barnhart Construction is a commercial and residential construction company. GL Barnhart started in 1997 focusing on home improvement and small commercial renovations. 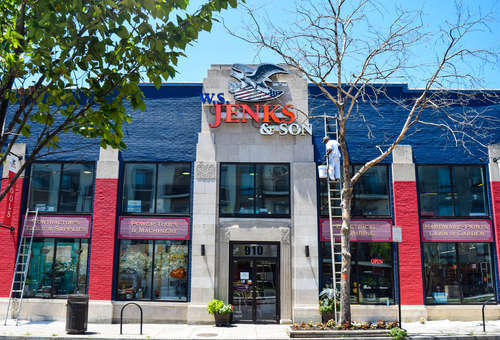 Today, the company focuses on masonry and concrete, roofing, historic restorations, and structural repairs in the historic neighborhoods around the Capitol Hill area of Washington, DC. They focus on the Capitol Hill and surrounding DC area because they love this neighborhood. Their experience makes them a good fit for DC in many ways, and they have an extensive background in historic renovations, which is essential for construction in this area. Click their logo for contact info or call 202-569-8471. Traditions General Contractors is a DC based company that does work in Montgomery County as far north as Germantown in Maryland and south into Alexandria, Arlington and Fairfax County, Virginia. They are experienced Architects and Builders, offering full design/building services, focusing on residential remodelling and additions as well as new home construction.